PHILADELPHIA, PA – December 3, 2018 – Janney Montgomery Scott LLC (“Janney”), a leading full-service wealth management, financial services, and investment banking firm headquartered in Philadelphia, PA, announced that it has further expanded its presence in Virginia with the opening of a new office in Fredericksburg, VA. The office represents Janney’s fourth branch office in the state and the seventh new location opened by the firm in 2018. Joining the new office is Holmes Riley Wealth Advisors, a four-person team with more than 40 years of combined financial services industry experience and nearly $200 million in client assets under advisement. The team joins Janney’s Fredericksburg office from Merrill Lynch and consists of Ronald H. Holmes, Senior Vice President/Wealth Management; Whitney E. Riley, First Vice President/Wealth Management; Lois Pierson, Senior Registered Private Client Associate and Brennan Holmes, Private Client Associate. 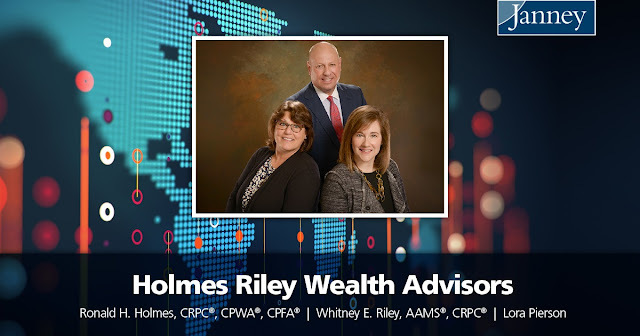 Ronald H. Holmes is a 25-year industry veteran, Chartered Retirement Planning CounselorSM (CRPC®) and Certified Private Wealth Advisor® (CPWA®). With an emphasis on planning and diversified portfolio construction, his practice focuses on high-net-worth clients and includes many intergenerational families, business owners and corporate executives. Active in his community, he serves as Chairman of the Fredericksburg Area Youth Development Foundation, Director of the Fredericksburg Regional Chamber of Commerce Board and Vice Chairman of its Enterprise Board, Director of the College of William and Mary Athletic Foundation Board, and is the Immediate Past Chair of the Virginia Foundation of Community College Education. He earned his BS in Biology from the College of William and Mary and MBA in Finance from George Mason University. An Accredited Asset Management SpecialistSM (AAMS®) and CRPC®, Whitney E. Riley joins Janney with over 15 years of experience in providing customized financial plans and investment strategies centered around clients’ individual needs and preferences. For the past seven years, Ms. Riley has served as Director and Vice President of Empowerhouse, a nonprofit organization that supports survivors of domestic abuse and their children. She is also a member of the Community Foundation Women and Girls Fund. She earned her BS in Finance from the University of Virginia. Janney’s Fredericksburg office is located on 725 Jackson Street, Suite 204, Fredericksburg, VA 22401.